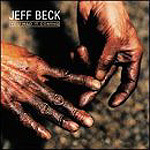 CD review: "You Had it Coming"
This review first appeared in the April 30, 2001 edition of the American Reporter. Eric Clapton and Robin Trower revert ever deeper into the blues, Eddie Van Halen tours the oldies circuit reliving a heyday longer and longer in the tooth, and both Aerosmith's Joe Perry and the Stones' Keith Richards seem content to churn out the same tired riffs. And yet here's Jeff Beck  who came up in the early '60s with both Clapton and Richards, a hero to Van Halen and Perry  still exploring new sounds, still pushing the boundaries, still exploring that mysterious territory somewhere between rock and jazz. Among top-rank rock guitarists, only Carlos Santana has stayed relevant anywhere near as long as Beck  and even Santana hasn't changed gears nearly as often nor as radically. While Santana scored multiple Grammys for his cross-over laden "Supernatural" two years ago, Beck is way beyond the safe territory in which Grammys are awarded. Continuing to push boundaries both stylistic and structural, Beck is becoming a senior mentor much like Miles Davis in the latter parts of his career  someone so respected and idolized that the younger musicians don't even bother trying to keep up anymore, and content themselves with simply following where he leads. After a quiet period in the '90s, Beck seems intent on making up for lost time with a series of albums released in quick succession, each of which is a little more daring, a little more assured. Of course, nothing is ever easy with Beck. Despite the heightened confidence apparent in his playing, Beck seems more musically impatient now even than in the '70s, when his incessant curiosity often gave his music far more energy than focus. One can't really compare "You Had it Coming" to any other Beck release, not even 1999's "Who Else," which featured fellow guitarist Jennifer Batten. "You Had it Coming" is far edgier than the previous release, and maintains a higher energy level. This is not only Beck's most daring album in a career delineated by ground-breaking releases, it also contains some of his best playing yet.